Last week I wrote a post about how to use lair and legendary actions as a way to combat the issues with the action economy for boss fights in D&D 5e. The action economy is an issue that DMs need to be aware of when creating any combat encounter. It’s also a reason that challenge rating is not considered totally accurate. Action economy is a concept that states how many attacks, abilities, etc. a creature can do on their turn. By knowing what each creature or player can potentially do on a turn, you’ll know what each side is capable of. The PCs almost always have a larger action economy due to the nature of 5e. The issue is that the side with the bigger action economy can invoke more attacks or cast more spells. This gives them an edge over the other side in any given combat encounter. Basically, the action economy dictates that the side with more opportunities is more likely to succeed in combat. If you have more opportunities to deal damage, you’re more likely to deal damage. Before we delve into this problem let’s take a look at what PCs and creatures can do on any given turn in combat. A handy reference sheet I found a while ago for player actions. Credit: mcbobboreddit. That reference sheet above is golden. It really helped me understand combat when I first started playing 5e. I’ve shown it to all of my new players before we began a game and it’s helped immensely. 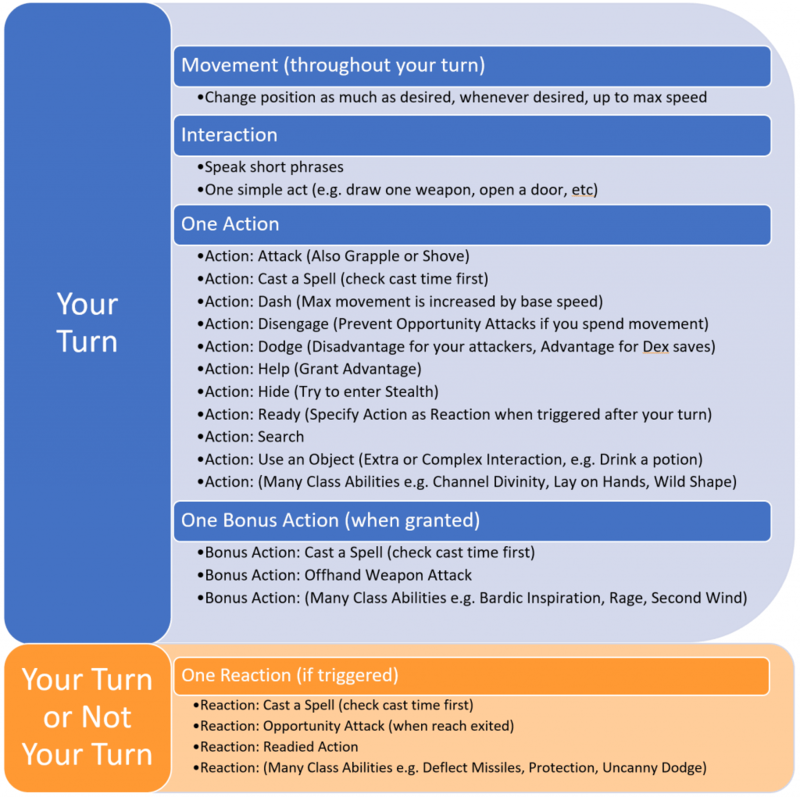 If we break down a basic turn of combat a player gets movement up to their speed, an interaction (item or otherwise), an action, and possibly a bonus action on their turn. They may also get a reaction such as an attack of opportunity or a class action. For the sake of the action economy let’s say that players get between 3-5 “actions” per round depending on if they can use their bonus action or reaction. Multiply this by the number of players you have in your party and that’s the total number of actions your players can take in a single round of combat. Creatures can potentially have the same amount of actions per turn as PCs. However, it is much rarer for a creature to be eligible to take a bonus action compared to a player. There are very few creatures that have bonus action abilities, and normally when they do it’s because it was triggered based on something they did during their action. For example, take a look at the gnoll’s Rampage trait or the goblin’s Nimble Escape trait. Bonus actions are reserved for specific creatures. These creatures also seem to be in the minority. While some creatures may have the standard 3-5 actions per round, it’s safe to say that most will have only 3-4 actions per round. Epic creatures with legendary actions and lair actions are an entirely different beast in terms of the action economy. Instead of the normal 3-4 actions per turn for creatures they have between 3-7 (or 8 with a bonus action). A lair action adds 1 action per round. Legendary actions can add anywhere from 0-3 additional actions per round depending on how many legendary actions are consumed per action. An epic creature can potentially have almost 2 PCs worth of actions per round of combat. Though, this still puts them at a disadvantage when fighting a 1v4 scenario. Single creature boss fights in D&D 5e are just hard to manage due to the action economy. You should be able to see the issue here. On average, PCs potentially have 1 extra action they can use on their turn compared to most creatures. This comes in the form of a bonus action which can be pretty significant depending on the situation. For dual wielders or polearm masters, it’s an extra weapon attack. Some casters can cast a spell as a bonus action and a cantrip on their action. When you have 5 players in your party this could be 5 more actions each round of combat. The number of players you have will determine just how heavily the action economy swings in their favor. However, the same can be said for the creatures if they outnumber the players. If we assume the average party size is 4 players they’ll only have potentially 4 extra actions per turn compared to 4 creatures. You’d only need a group of 5 creatures to potentially have the same sized action economy for both groups. This is how the action economy affects encounter design. The side with the larger group will typically have the larger action economy. They have the potential to deal more damage, heal more damage, buff their allies, CC or debuff their enemies, or move about the battlefield to get into a better position. All of these actions are advantageous in a combat scenario. 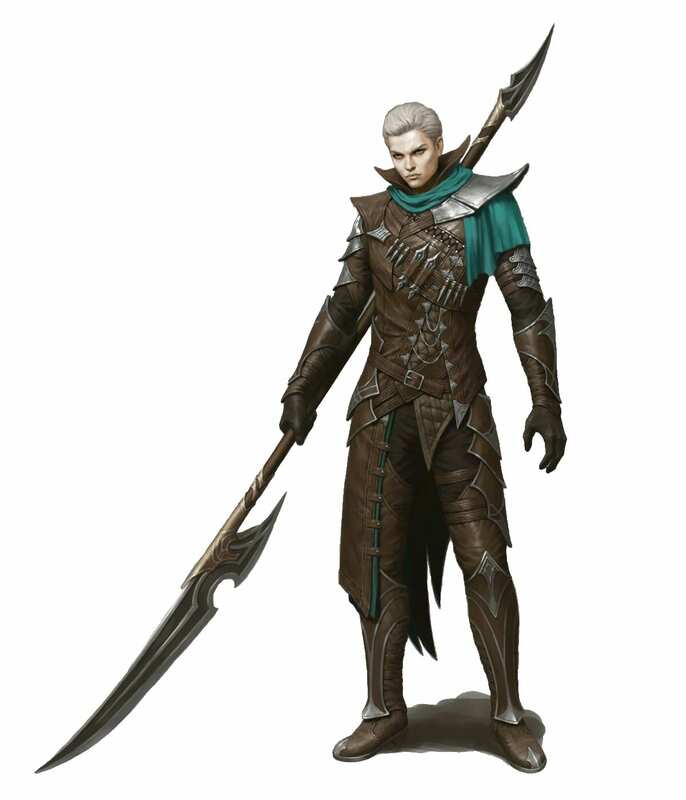 Feats like the polearm master can give PCs more uses for their bonus action. Credit: roleplayerguild. As I said at the beginning of the post, lair actions and legendary actions are two mechanics you can invoke to help beef up your creatures’ action economy. However, this really only gives them an extra PC’s worth of actions per round at best. Another way that I’ve touched on is to simply add more creatures. Having party+1 creatures in a round keeps both sides at about the same sized action economy. Throw in a couple of weaker minions in with an epic creature and you’ll have yourselves an evenly matched boss fight. Add environmental effects and traps. Difficult terrain that affects the party’s movement, but not the creatures’ help to mitigate the slight advantage they have over the creatures. Traps either force the party to avoid an area and lessen their positioning potential, or add an action to help the creatures damage the party. Make the party expend resources between combat encounters. If they use their spell slots and class abilities outside of combat, they’ll have less to do while in the encounter. If a fighter does not have the use of their Action Surge or Second Wind they’ve lost some of their action economies before the fight has begun. This is just another reason why I’ve said not to use only 1 encounter per day or rest in 5e. You really will want to avoid having creatures by themselves, even if they are at a much higher CR than the party is usually capable of. Yes, your adult red dragon is extremely powerful and can potentially drop your PCs in a round or two. However, if they get the jump on it in the initiative order you’ve already been beaten around with 2 to 4 times more actions in a round that your dragon is capable of. This is one reason why I and many others recommend having minions in a boss encounter to combat the action economy. Yes, your dragon is last in the initiative order, but the 3 guard drakes that are accompanying it are able to get some swings in on the party to soften them up! CR is WotC’s way of determining how powerful a creature is. They absolutely take into account the fact that more creatures in a fight mean it is a more challenging fight. However, this is still an estimate and they can only be so accurate. One major issue is that they can’t take into account magic items your party may have when they determine the appropriate CR creatures for your party to face. Magical items can also give PCs access to actions that they would not be able to do otherwise. This is why you may have to consider throwing creatures a bit more challenging at them than what’s “appropriate” for their level. The more magical items that affect combat, the higher the CR you’ll have to use. Lair actions and legendary actions both add CR to a creature by default. This is one example of CR being balanced around the action economy to some degree. Another is that the more creatures added to the encounter, the more challenging it becomes by an exponential scale. The more actions the creatures have compared to the players, the deadlier the encounter. Basically, CR becomes a bit more broken and more of a loose guideline the more powerful your players get. You’ll want to have an idea of what your group is capable of and understand the action economy of your chosen creatures to really determine how challenging the fight will be. Use your best judgment. You know your group better than WotC. When creating your own encounters be sure to take the action economy of both sides into account. Having a fight where your creatures are severely outnumbered by the players is a recipe for disaster. That epic boss fight you made with a single creature will be a lot easier than you anticipated because of its ability to only do 1-2 player’s worth of actions. Be sure to also keep in mind what magical items and feats the party has. A magical item giving a PC access to Misty Step or Healing Word would give them a potential bonus action they may not have otherwise been able to use. Feats like polearm master will also give a PC access to a reliable bonus action when they wouldn’t otherwise have one. Understanding the action economy in 5e is the first step to learning how to design interesting and balanced encounters and homebrew. It’s a pretty simple idea, but there is a lot of depth to it. This a really well written article, from my perspective as a teacher. Thank you. As a new DM, I’ve found this info very helpful.